Roman numerals are what my five year old son is currently interested in. And like anything he becomes interested in, he picks it up instantly. However, I like to reinforce the concepts regardless. Plus, I like to push him outside his sensory comfort zones from time to time. Painting has been outside his comfort zone for a couple of years now, so I would like to get him used to the texture and feel of paint again. The result? We combined math and art into this simple LEGO stamped Roman numerals activity. Love the way these Roman numeral prints turned out! 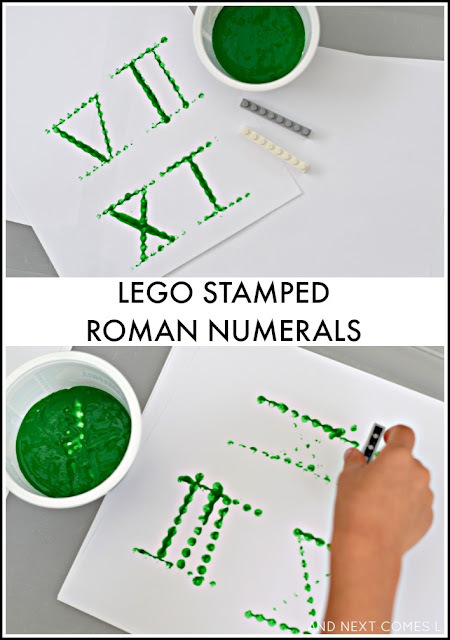 We also combined LEGO with Roman numerals for another activity! Try this LEGO math tray to practice sequencing Roman numerals.